Jerry S Pace, age 60, passed away of heart complications in his home in N Fort Myers FL on Sunday, July 15th, 2018. He was born on Sunday, January 12th, 1958 in Key West, FL. A graduate of North Fort Myers High School class of ’76, he went on to serve honorably in the United States Navy as an Aviation Mechanics Mate. After his service, he worked diligently to learn everything he could regarding carpentry. He went on to become a master of his craft, working for himself as an independent construction contractor. His work can still be seen all over Florida today. 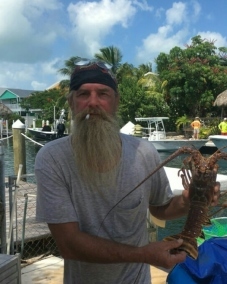 His joys in life consisted of shooting pool, crossword puzzles and the annual Key West family vacation to dive for lobster - “I catch the most and the biggest,” he would proudly exclaim. But above all, family and close friends were what he valued most. You loved him or hated him, and for those who knew him well, it was both. Jerry was a loving son, brother, uncle, father and father like figure. He was a great friend to all who were lucky enough to know him. And for all who did know Jerry, they knew he would do anything for anyone. He is survived by his son John, sisters: Linda (Rick) and Susan, brothers: Glenn (Donna) and Mark (Darryl) and many well-loved nieces and nephews: Rebecca, Jessica (Mike), Thomas (Rachel), Alicia, Dustin, Derek (Mandy), Megan, Zac (Taylor), Zoe as well as many other family and friends. He will be missed by all. A memorial party will be held July 28th please email John at acehole131@yahoo.com for details. In lieu of flowers, the family request donations be made in the name of "March of Dimes", "Hope Hospice" or any local veterans organization. Dr, Fort Myers, FL 33916. The event will be from 6 p.m. to 9 p.m. and the dress will be casual.